It did not take long for alarmist trolls to react to my hurricane paper. Increasing Atlantic Hurricanes since 1851? What about the trend line in figure 9 above, which indicates that the number of reported Atlantic hurricanes has been increasing at a rate of 1.3 hurricanes per decade? Some have used figures like this to conclude that climate change has caused increasing numbers of Atlantic hurricanes. 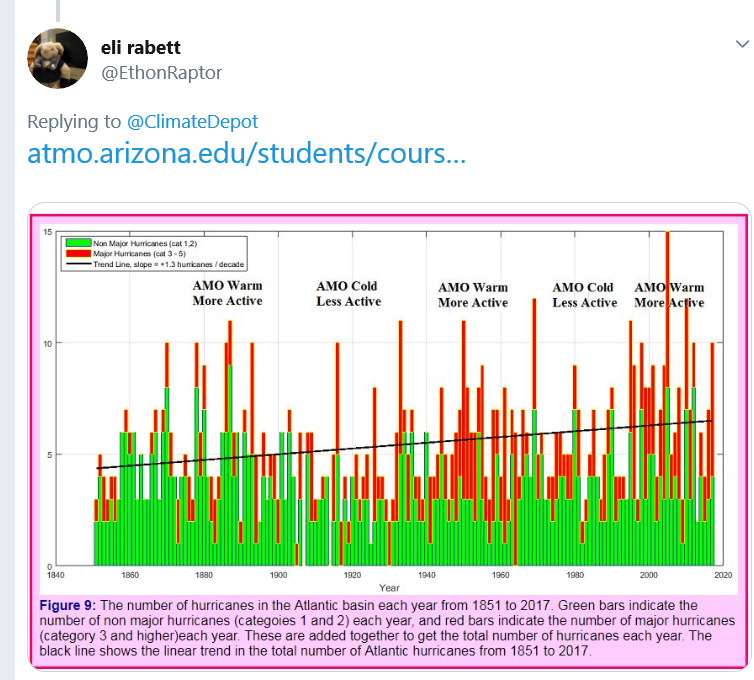 In reality, the trend can be largely explained by changes in the way we observe hurricanes, rather than a real trend of increasing hurricanes since the 1800s. Long ago, when populations were smaller and there were fewer people making observations, there were undoubtedly storms that were simply missed and not counted. In recent decades, no storm will be missed. Thus, scientists and statisticians need to make adjustments for storms that were completely missed. Another factor is that there has been a large increase in the number of short duration storms in recent decades, where a short duration storm is one that lasts two days or less. Since the beginning of the satellite era, we have significantly improved our observations of hurricanes from space. Short duration storms that went undetected (and uncounted) in the past are more easily detected and counted today. The figure below indicates the increase in short duration Atlantic storms, which is responsible for much of the trend shown in figure 9. 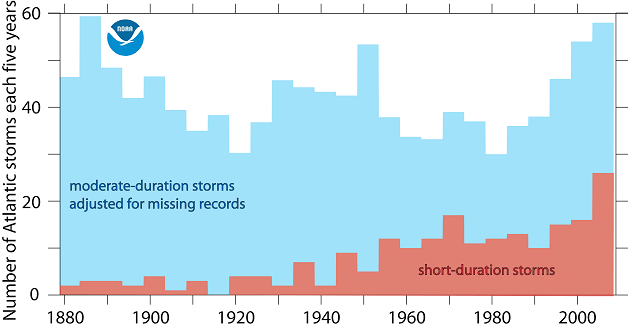 The figure below also shows that there has been no significant change in moderate duration storms from 1880 to 2010 after accounting for the long ago missed storms. These results show that the increase in Atlantic storms in figure 9 is an artifact of the way we have observed storms, rather than a real climate change toward more Atlantic hurricanes. Nowadays all Atlantic storms are constantly monitored by satellite, and hurricane hunter aircraft where appropriate. I wonder how he thinks we used to do it in 1851? Eli Rabett is really Dr Joshua Halpern, who prefers to hide behind a pseudonym, and likes to think he is smarter than the rest of us. If this is the best he can do, he really must try harder in future. ← Regional Models: 3-10°C Warming In The Next 80 Years. Observations: No Warming In The Last 40-100 Years.